From 2 June, the Princessehof National Museum of Ceramics in Leeuwarden will be presenting a high-profile exhibition on four Dutch success stories: Delft Blue, Maastricht pottery, Art Nouveau ceramics and Dutch Design. Inspired by foreign techniques and styles, manufacturers in the Netherlands repeatedly came up with new products and made them successful. Impressive flower pyramids, colourful Boerenbont, popular Gouda pottery and the contemporary tableware of Scholten & Baijings tell the story of how the Netherlands became a world player in the field of ceramics. Made in Holland: 400 years a global brand will be on display at the Princessehof from 2 June 2018 until 30 June 2019. Dutch ceramics are known all over the world and have been exported in massive quantities for centuries. The exhibition takes visitors on a tour through five rooms full of sources of inspiration, highlights of the craft, export products and foreign imitations. Around 1600, the VOC introduced Chinese porcelain to the Netherlands. These blue-and-white dishes and bowls were extremely popular and very expensive. Dutch ceramic factories imitated these wares in painted pottery. Many of these factories, such as De Grieksche A and De Metaale Pot, were located in Delft, hence the name Delft Blue. The quality of their products was so high that they were exported in abundance to the rest of Europe and even to Japan. The exhibition features spectacular flower holders, ornate terrines and complete garnitures for the Eastern European market. Dutch tiles were also exported on a large scale from Amsterdam, Rotterdam, Utrecht and Harlingen. 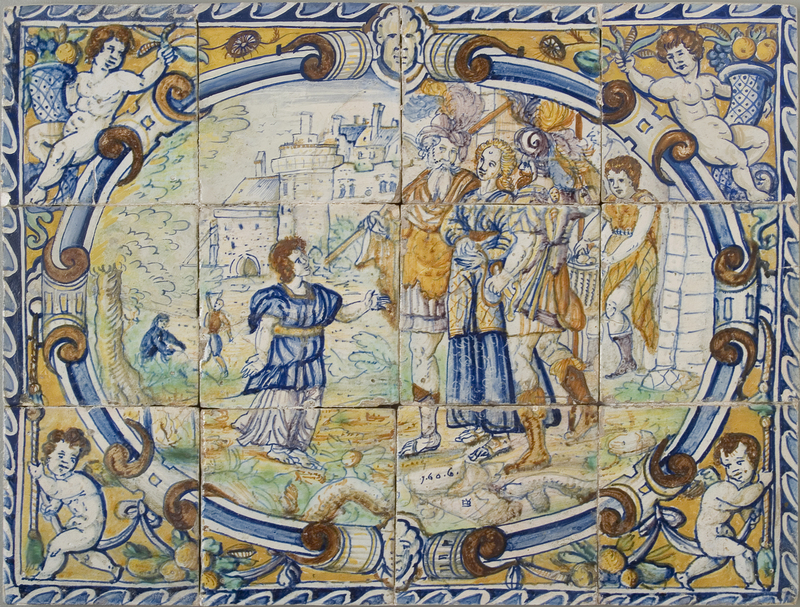 An impressive tile panel, consisting of no less than 585 tiles, illustrates this trade. In the 19th century, the Maastricht entrepreneur Petrus Regout succeeded in using another technique developed abroad for his own success. As the producer of transfer-printed earthenware in the Netherlands and the hand-paintedBoerenbont, he became the first major industrialist in the country. After the opening of Japan in 1858, Regout was one of the earliest to export to the land of the rising sun. He immersed himself in Japanese culture. Carefully transfer-printed sake sets and rice bowls with exactly the same capacity as similar vessels in Japan testify to his commercial spirit. Services with geometric transfer-printed decorations and Islamic symbols demonstrate his understanding of the Indonesian market. Although the origin of Art Nouveau ceramics lies abroad, it was soon embraced in the Netherlands where it was interpreted in unique ways. More than forty Rozenburg objects can be seen in the exhibition. At the 1900 World Exhibition in Paris, this manufacturer from The Hague caused a sensation with the introduction of its fine eggshell porcelain. The Gouda Plateelbakkerij Zuid-Holland (PZH) conquered the American market from 1915 onwards. Vases, plates, clocks, candlesticks and clogs show the characteristic layer of matt glaze and the motifs inspired by Persian ceramics and Greek-Cypriot pottery. The exhibition includes numerous objects from renowned manufacturers such as De Porceleyne Fles, Amstelhoek, Brantjes and De Distel, all of which were also successful abroad. The exhibition also examines the emergence of a new attitude at the end of the previous millennium. Dutch Design stands for minimalism, unconventional solutions and a sense of humour. Designs by pioneers such as Gijs Bakker, Marcel Wanders and Hella Jongerius exemplify the minimalist approach. A teapot by Wieki Somers and a vase by Maarten Baas show a more playful attitude. Recently, designers such as Floris Wubben and Olivier van Herpt have been bridging the gap between innovative technology and centuries-old craftsmanship. Richard Hutten and Studio Job draw inspiration for their designs from the 400-year-old tradition of Delft Blue. The recent designs by Ching-Ting Hsu and Jing-He, among others, prove that Dutch Design is an inspiration far beyond the Netherlands. More than 700 loans from all over Europe are coming to Leeuwarden for the exhibition. The museum’s own collection is supplemented with masterpieces from the National Museum in Gdańsk, the Museum für Kunst und Gewerbe in Hamburg, the Museum of Applied Art in Vienna, the Royal Museums of Fine Art in Brussels and various private collections. Paul Toornend is responsible for the exhibition design. Especially for the exhibition a team of experts was appointed to carry out scientific research. They have unearthed important new insights on the export of Dutch ceramics from the 17th up to and including the 20th century. The results of this research, on which Made in Holland: 400 years a global brand is based, are compiled in the publication that accompanies the exhibition. This new standard work on Dutch ceramics, edited by curator Karin Gaillard, includes contributions by Jaap Jongstra, Eline van den Berg, Wim Dijkman, Yvonne Brentjens, Bert-Jan Baas, Barbara Walraven, Henk Wolffensperger, José van Bragt and Victoria Anastasyadis. Erik and Petra Hesmerg took the photographs. The exhibition Made in Holland: 400 years a global brand is part of the Leeuwarden-Fryslân European Capital of Culture 2018 and is made possible by presenting partners og LF2018: ING, Arriva and Leeuwarder Ondernemersfonds. The exhibition is made possible with the financial support of the Turing Foundation, Mondriaan Fund, Fund 21, Van Achterbergh-Domhof Foundation, Stichting Het Nieuwe Stads Oreshuis, Friends of the Princessehof, Stichting Herbert Duintjer Fonds, Stichting Juckema-Sideriusfonds and Boelstra Olivier Stichting.